Despite my right knee still feeling slightly swollen from Sunday’s run and yard work beating I decided to give a run/pedal training brick a go. My knee felt ok during the nearly 2.25 miles I put in on the treadmill. 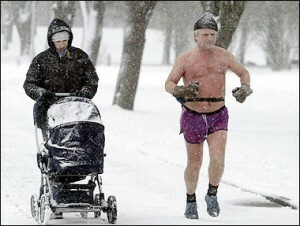 During the run I was thinking about my winter runs in PA years ago. I clearly recall running in bitter cold with snow actively falling from the sky. I remember my nose running like a river only to soon have the snot freeze to my face and how the cold air hurt has it got sucked into my lungs in large quantities. I then remembered why I am glad I don’t live there anymore. That feeling was duplicated this morning when I saw the current temperature in my old hometown was a frigid 4 degrees.